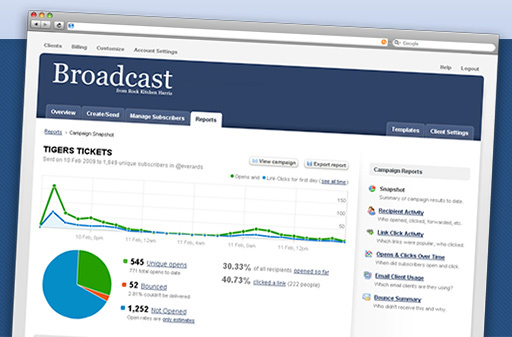 It's simple - we do the design, you add the content, manage subscribers and track the success of your campaigns using Broadcast's built in reporting facilities. No installation, no setup, no fuss. Most email marketing tools are expensive and difficult to use, and turn your memorable message into poorly designed spam. Our highly skilled and experienced designers will produce a professional, functional email design which is tailored to your requirements as well as built to display well in all major email clients. There's no software to install, set up or configure. Broadcast is entirely web-based so you can log in from anywhere. With our simple, transparent pricing structure, we think Broadcast is worth every penny. Pay-as-you-go costs just £25 per email, plus 1p per recipient. Frequent users can subscribe for £40 a month, £10 per email, plus 1p per recipient. Is there a limit to how many emails I can send? No, you can send as many email campaigns to as many recipients as you like. Can I have more than one email template? Yes, we can design as many templates as you need. This is useful if you need to send out different campaigns with different layouts or designs. Contact us to discuss your requirements. To see Broadcast in action, or just to find out more, call Ian Moore on 0116 233 7500 or email broadcast@rkh.co.uk or simply fill in your name and contact details below and we'll get right back to you.